A Retractable that actually has a attached real leash with the patent pending Zipp-n-Go tecnology. This Retractable has two handles, and gives the dog owner alot more control we they need it fast. 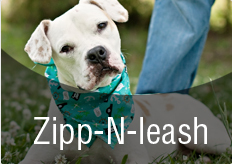 A Retractable that actually has a attached real leash with the patent pending Zipp-n-Go tecnology. This Retractable has two handles, and gives the dog owner alot more control we they need it fast. This is the first of its kind and comes in 6 differnt colors. I've tried every leash made basically. It wasn't until the zipp-n-go leash that I was actually able to walk my dog. She is part pitt and pulled so hard on the leash that she would choke herself, harnesses proved an issue as well as she pulled so hard on those that she would cut the skin under her arms and pull the pads off her feet. I'll never use another leash again! I will own dogs all my life, and the zipp-n-go will be the leash for all of them! This is the first retractable I have used where I actually feel like I have control of my Westie, Chloe. She loves to chase squirrels and with most retractables I can not hold her back with out hurting her or myself. The Zip N Retractable allows her and I to enjoy our walks! Thank you Jeff for coming up with such a great product. What an ingenious idea to attach a retractable handle to an actual zipp-n-go. We love our zipp-n-go and when we saw this we thought we would give it a try since there are times the retractable ability comes in handy. Works great. You always have the control you may need that no other retractable can offer since there is a handle to use. I have shown this product to several friends who are anti-retractable due to the loss of control. They were VERY impressed. Thank you DoggBoss for making this product available.